Listening to the hallowed thump of my father’s fingers on the wood, the tiny squeak of the tuning pegs pulling tension on the strings, my two brothers and I gazed like giddy, perfect Buddhas into the hollow bodies of our parents’ Martin guitars from our spot on the floor at their feet. And we watched their fingers strum and pick—the steel and the nylon—as they fumbled with their capos, and belted out the pages, one soprano, one alto, of torn sheet music with their throats. 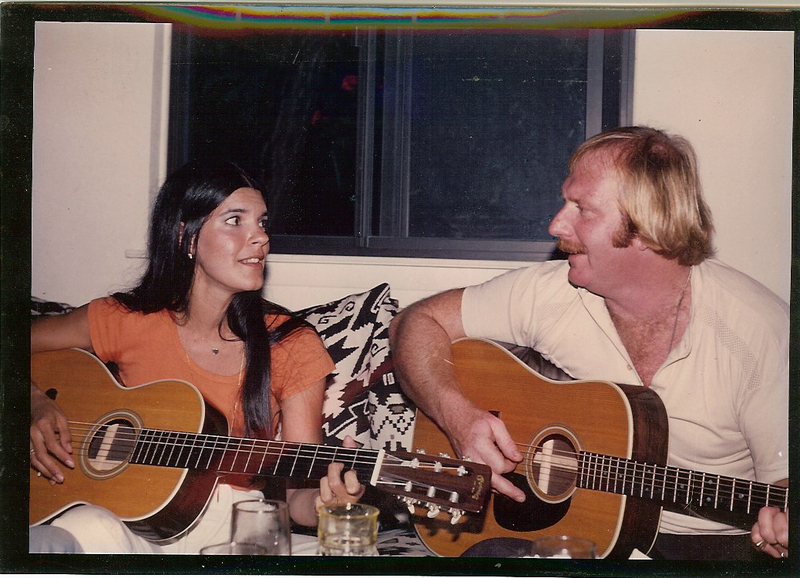 These folky jam sessions where my father sang into my mothers eyes and struggled to reach those higher notes never lasted all that long. The moments before someone was first to put down his or her guitar, to grab a cigarette, sounded best. The last notes hung sweetly like a tremolo, something mysterious and dark hovering overhead, a lumpy fog of calamitous death. And it held us in place, for fear the slightest of our movements be the cause of this end. Except our voices, which rose above each plucked string along the fret, and danced, and knew we had no choice but to let go. This entry was posted in Poetry and tagged Bob Dylan, divorce, fiction, flash fiction, guitar, John Denver, kids, literature, Love, mother, music, musings, Poetry, Short Stories on January 25, 2011 by sevenperfumes. You have many great word combinations… “…perfect Buddhas…” and “..sang into my mothers eyes…” for example. Beautifully written. Is the photo of your parents? Your mother was GORGEOUS! Thanks, Lauren. And yes, those are my parents circa 1979. My mama was definitely a hottie back in the day. I was 11 here, so that makes her about 31.